Is your dog great with kids? A lot of dogs are good babysitters. If dogs are just socialized properly, they can be really great with kids. Every kid should be taught how to respect dogs too. ‘Coz childhood is just so much fun and so much better when there’s a dog around to play with! This video we have for you is so cute that it will leave you smiling all day. 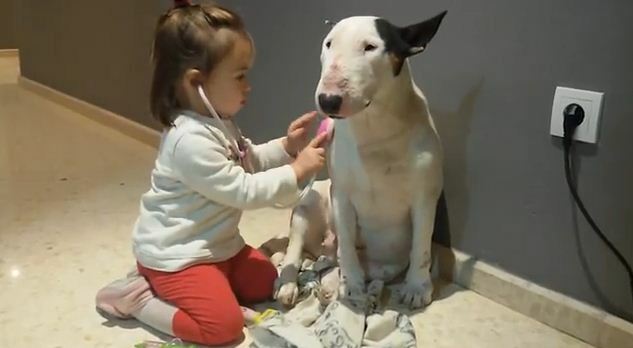 A dad caught her daughter playing doctor with their dog. Manuel Ruiz Villareal took a video of her adorable daughter Noa playing with their very patient dog, Neckar. Noa is such a good doctor and she’s giving Neckar a full checkup, and gave him a vaccine too. She gives him the shots that he needed, then she checked his ear, and then his heartbeat! Neckar was a very good dog the whole time. He was so patient with his doctor. Check out the adorable video below! That was just so cute!! This girl has the most patient, best friend (and playmate) in the world! I hope Neckar got some treats after his checkup! He was so well-behaved the whole time!